Since it is now (unofficially) summer, I figured there was no better way to welcome the change of seasons, as well as the sweltering heat, than a cool, sweet batch of ice cream. After having enjoyed, or suffered depending upon how you look at things, 40 degree weather and sporadic bouts of drizzle in my last few weeks in St Andrews, stepping off of the plane in Charleston was a shock to say the least. Tiny beads of sweat threatened to form on my forehead, and my hair was instantly transformed into a wild mess that even Tina Turner might try to tame. I immediately regretted my choice of travel-wear, wishing I had gone for the Nike shorts and t-shirt that I always scorn in favor of something marginally more stylish but obviously less comfortable. A few days of wandering around in the dizzying warmth later, and I only had one thing on my mind- ice cream. Now I will be the first to admit that there is absolutely nothing wrong with a good old pint of Ben & Jerry's. If we're being honest here, I probably enjoy a bowl or two more often than I should. 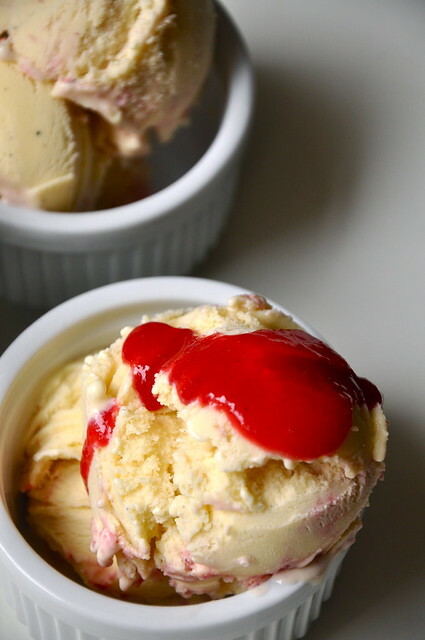 But really, nothing compares to the luscious, creamy goodness of a scoop of homemade ice cream. I think it's because you can really taste the cream. And I mean really taste it. It tastes clean and bright, but it's still addictive and sweet. I meant to make this to go along with a cake I made for my little brother's birthday, but, having forgotten to put the ice cream bowl in the freezer the day before, the cake had to fly solo. Because Riley is quite the, er, selective eater, I immediately ruled anything chocolate-y out along with a whole slew of other flavors I was itching to try. Riley is a vanilla man through and through, but I thought I'd put a little twist on his favorite flavor. 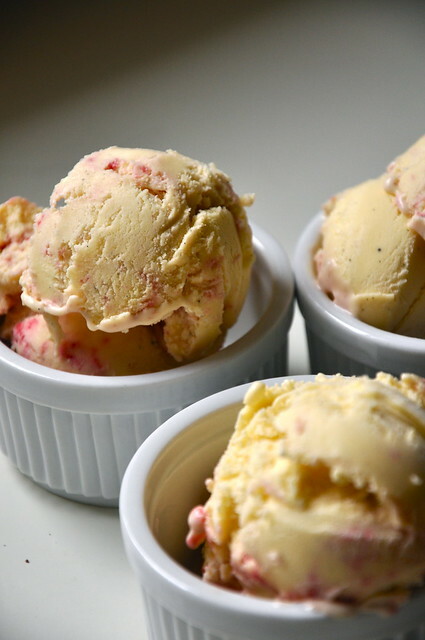 Plus, a pink and white marbled ice cream is too pretty to resist, right? Anyway, this ice cream is delicious and refreshing and just plain perfect. Happy Summer! In the bowl of an electric mixer fitted with the whisk attachment, whisk egg yolks and sugar until pale. Meanwhile, pour milk and heavy cream into a medium saucepan. Scrape beans out of vanilla pod into saucepan and toss pod into saucepan. Bring to a boil. Remove bean pod. With mixer running, carefully pour milk mixture into egg mix. Transfer combined mixture back into saucepan and cook over low heat until custard coats the back of a spoon. Strain into a medium bowl. Chill bowl in refrigerator until completely cool. Freeze in an ice cream maker according to manufacturer's instructions. Meanwhile, blend raspberries and powdered sugar in a food processor. Strain into a small bowl to remove seeds. 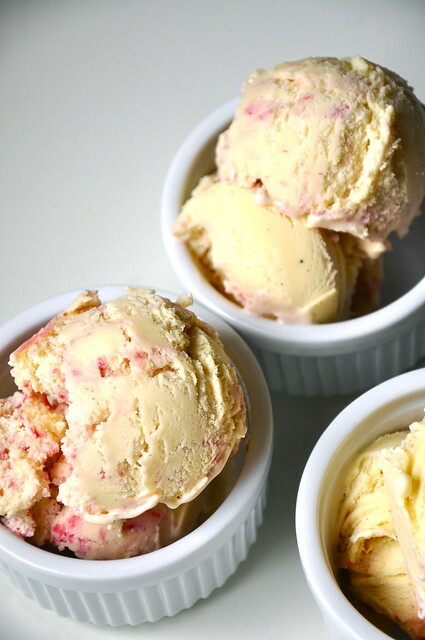 Once ice cream has solidified, transfer 1/3 into a tupperware container. 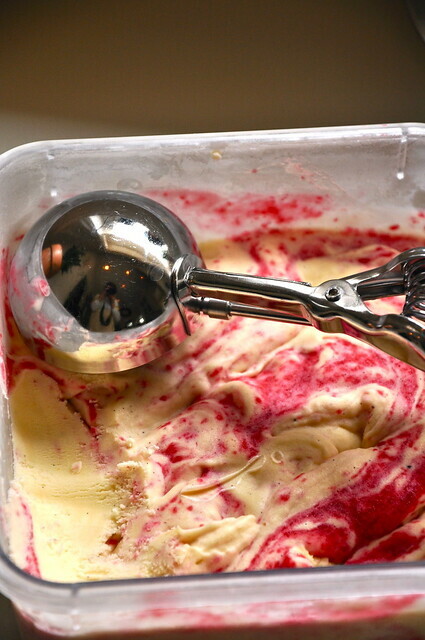 Drizzle 1/3 raspberry mixture over ice cream and swirl with knife. 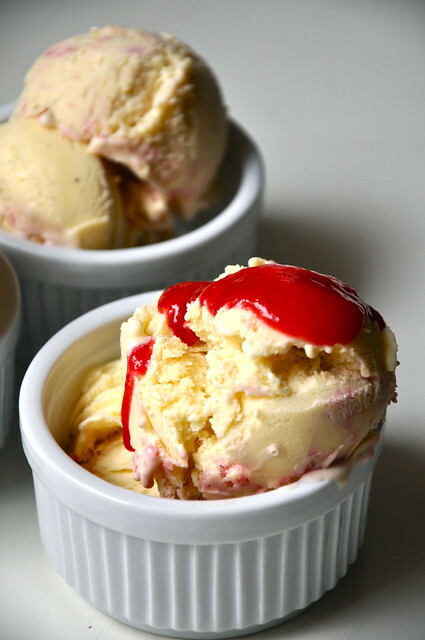 Repeat twice more until all ice cream and raspberry sauce has been used. Freeze until ready to serve. OMG. *mouth-watering* love this post! Juno- I'm so glad you like it! I hope you'll keep reading!